Muddy Colors: SmallCon, Big Weekend! I attended and displayed in my first science fiction-fantasy art show at the 1992 World Fantasy Convention in Atlanta. Since then I regularly began attending about five shows a year all over the United States. That makes over 100 art shows in my career that I have been to. Some as large as San Diego Comic Con with 150,000 visitors and some as small as NeCon with less than 500. Both large and small have there advantages. As the fantasy business becomes more mainstream with video games and films, comics and cosplay the venues have all melded into massive geek-themed South by SouthWest festivals. Show promoters and the cities that host these shows make a lot of money, as do the artists that attend them. Over the past decade I have noticed that with demands on my time, I will now do only one or two shows a year at huge convention center venues where I can make more in one weekend than I could at a half dozen small shows. This is just good business. But, what about those smaller regional and local shows? Are they still around, do people still attend, and why as an artist would you want to do one? That's what this blog is about. Intimate Venue. The best part of a small regional show is that it is small. The atmosphere is very casual and relaxed. It is possible to sit and spend a lot of time getting to know the fans, the attendees, other artists, and to attend and take part in panels and demonstrations. Most of these small shows are organized by local or regional Science Fiction Clubs so the management is voluntary and they are doing the show for the pure love of the genre. These shows are great times to arrange meetings and dinners with local friends and clients. Display and Dash. For me, the best part of a small show is the ability to display and dash. You arrive on a Friday, set up your display in 30 minutes, and you have until Sunday afternoon to chill out. You don't have to sit in a booth for ten hours a day. You don't have to handle money or haggle prices or process credit cards and juggle inventory. You have a whole weekend to do whatever you want. This free time is invaluable in business and life. Some of the best relationships and friends I've made over the past twenty years is with art directors and artists at these small shows. I recall a World Science Fiction Convention in Boston. With so much free time I chatted up the senior editor of Doubleday Books, and we ended up having lunch together on a bench in the Boston commons watching the ducks and working on the NY Times crossword. At the World Fantasy Convention in Providence RI the Art Director of D&amp;D and I spent Saturday afternoon walking through the galleries of the RISD art museum. At Lunacon in NY a group of art friends and myself decided to take advantage of the warm spring weather and walked around the sculpture gardens at the nearby PepsiCo campus, and in Saratoga Springs I visited museums, galleries, battlefields and the best Irish bar in the country with my art friends. These are just a few examples, but encounters like this are impossible if you are stuck behind a table in a booth signing Magic Cards and selling prints to fans. It may not pay dividends in immediate cash, but in value as an artist its priceless. Big Fish, Small Pond: Your average regional show may have 1500 attendees and a dozen artists. Of those artists there are perhaps four or five full time professionals. Even though the attendance is small the odds of selling an original work go up substantially at small shows, and winning an award is almost assured. Small shows have smaller overhead, (especially if you crash with at a local artist's house) so merely selling one piece can cover your expenses. Destination Venues: I have attended GenCon Indy in Indianapolis more than ten times and I have never been outside of the convention center and a small three block radius of bars and restaurants, even though there is an art museum and parks within walking distance. My favorite part of doing small display shows is that it gets you outside to visit the cities you're in. Museums, parks, historic sites etc, are all available if you have your weekend to yourself. These days I have a wife and two children with a very busy schedule and vacation time at a premium. To compromise we will often decide where we want to go, and then see if there is a show in that city, so that I can do an art show and we can all have a vacation. There are some great, fun and beautiful cities and they all have sci-fi shows, and its all a tax write-off! Here are some small display shows where you don't have to man a booth in some great cities on the American East Coast. I'd love to hear your recommendations and experiences for similar shows on the West Coast. I'm rating each show on a scale from 1 to 5 for Quality of Venue, Quality of Art show, and Quality of City. Artshow: 30 artists, 8-10 FT professionals. Cost: Artshow and Membership $200 Hotel: $150/day. What to do: Boston is an amazing town, even in February, and the venue is right in the middle of it in a beautiful new Westin Hotel. The show is well run and attended by fans and artists. Sales are generally reliable. 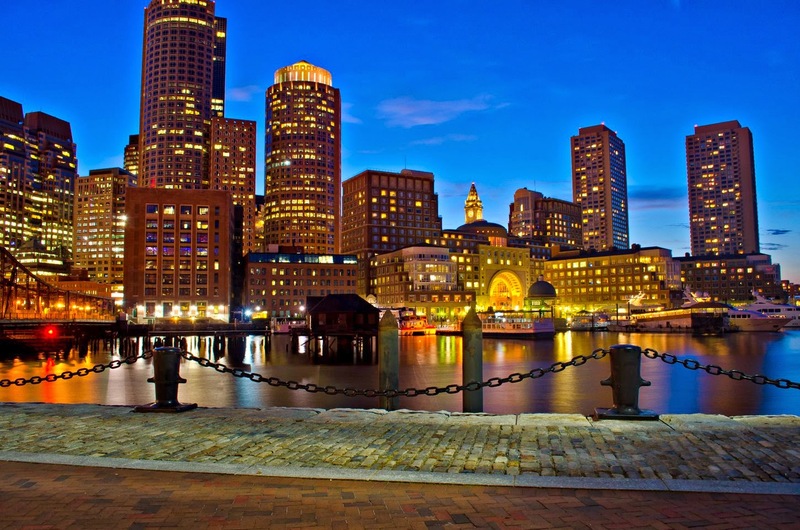 The Boston Art Museum, The Public Library, The Freedom Trail, Boston Commons, The Aquarium and great food, shopping and bars makes this a must-do show for me and my family every year. What to do: Lunacon was the must-attend artshow every year when I was starting out. It was the show for all the Art Directors and Artists that lived in and around Manhattan, showcasing 100 artists with 15-20 FT professionals and about 3000 attendees. With competition from Illuxcon and Spectrum Live artists from the region have stopped coming, and with NY Comic Con the fans have stopped coming as well. So what was a five star show unfortunately is a two. The venue is about 20 min. north of Manhattan by train. If you are looking for an excuse to make a trip to NYC this is the best opportunity for a Destination Venue for the greatest museums and restaurants in the country, (Metropolitan Museum of Art, Museum of Modern Art, The Frick Collection, Guggenheim, The Whitney Museum, The Museum of Natural History, The Society of Illustrators, etc, etc, et al...) Perhaps drop off some portfolios at the publishing houses. Lunacon is this weekend! It is literally going on right now. The convention's proximity to NYC attracts a lot of talented artists. This year's Artist Guest of Honor is Randy Gallegos. Venue: Hunt Valley Inn. Hunt Valley MD. What to Do: Edgar Allen Poe's Gravesite, the Waterfront, Camden Yard Baseball, The Baltimore Museum of Art, The Aquarium and a day trip to Hersey Park make this a fun trip for families. Always held for four days over Memorial Day Weekend. What to do: Although the venue is just over the river into NJ, Philadelphia is a beautiful destination city that's worth seeing. The Philadelphia Acadamy of Fine Arts, Philadelphia Art Museum, The Rodin Museum, The Philadelphia Zoo, Liberty Park, and Terminal Market make it a great family trip or for any serious artist. Artshow: (juried) 50 artists. 10-20 FT professionals. Cost: Membership and Artshow: $500 Hotel: varies. What to do: I have had some of the best times in my career at the "World" shows. Every one takes place in a new city each year, so I pick and choose by what city I want to go to. I never fly or travel internationally with my art, ( its cost prohibitive) so that leaves me attending these about once every four years. Baltimore, Boston, Providence, Madison, Columbus, Chicago, Atlanta and Saratoga Springs (my favorite) were all great shows, generally attended by serious fans and professional artists, authors and art directors resulting in good contacts, good sales and a great time. The Chesely Awards (Association of Science Fiction and Fantasy Artists-ASFA) are given out each year at the WFC. This years show is in Washington DC! The National Gallery, The Smithsonian, The Air and Space Museum, National Arboretum and the restaurants in Georgetown alone will make it worth the trip! What to do: The World Science Fiction Convention is like the Sci-Fi Oscars, where the Hugo Awards are given out each year. Every one takes place in a new city each year, so I pick and choose by what city I want to go to. Generally attended by serious fans and professional artists and art directors resulting in good contacts, good sales and a great time. Similar audience to World Fantasy.